Bring on the Pumpkin Everything! Pumpkin is full of so many nutritional benefits, and it's great to add to anything... sweet or savory! But my favorite thing to do is make tasty baked goodies around the fall and winter months. 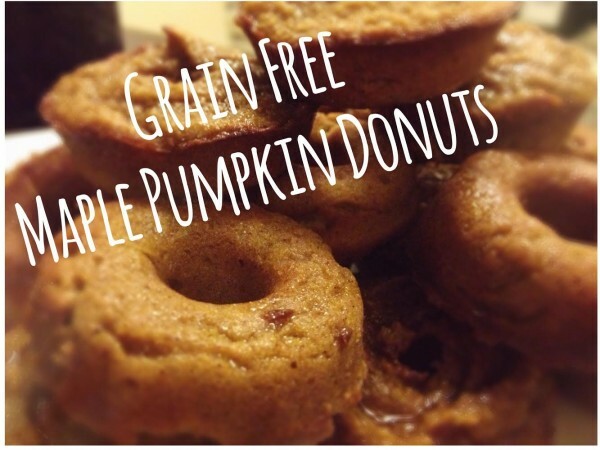 (Although, pumpkin is incredibly nutritious all year round) Bake up these easy Grain Free Maple Pumpkin Donuts for a delicious and nearly guilt free side to your morning coffee, breakfast, or a fun treat. Being grain free makes these donuts gluten free too. All you need to do is buy a donut pan, mix up your ingredients, pop them in the oven, and voila! Your Donuts are done! For Icing/Glaze, I created my own on a whim, but you can do so many different things to top your donuts. Drizzle with organic raw Honey, caramel, chocolate-- totally up to you! I went for more of the maple taste and kept it pretty clean compared to the over processed sugary options. You can also add toppings like chopped pecans, slivered almonds, coconut or chocolate shavings. Be creative! *Mix these ingredients together, dip the face of your donuts in this mixture and put on a cooling rack or on wax paper. Combine eggs with your pumpkin puree using a mixer. Combine until nice and smooth. Add coconut sugar, almond flour, baking powder and salt. Mix thoroughly! Bake for 12-18 minutes — depending on your donut pan it will be different for everyone, so keep a close eye on these! Let cool before removing donuts. Add your glaze/icing/toppings and set on a cooling wrack or wax/parchment paper to set.